For many people, bucket list destinations are, almost by definition, found in exotic and distant locales. Typically appearing on travellers’ dream itineraries are such splendours as the Taj Mahal; the Egyptian pyramids; the ruins at Machu Picchu; the moai of Easter Island; and the Great Wall of China. However, while many world travellers dream of voyaging to the likes of India or China, comparatively fewer explorers — particularly among those based outside the U.S. — aspire to descend upon the American state of South Dakota. 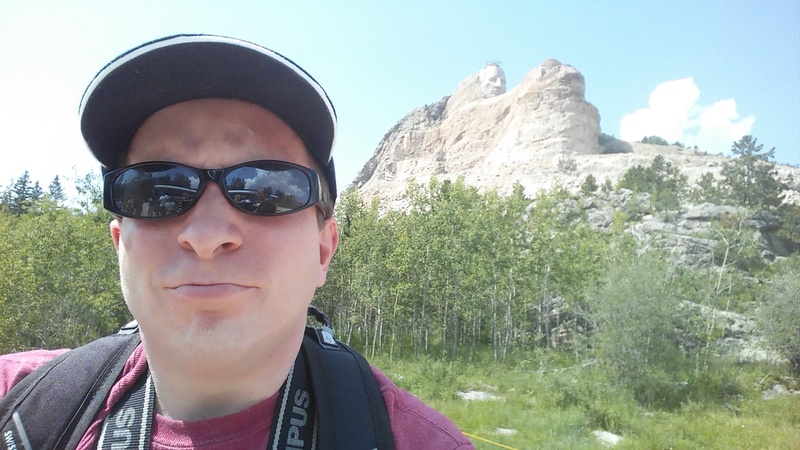 But earlier this month, I visited a genuine wonder that’s located in that great state of South Dakota: Mount Rushmore. My conclusion is that Rushmore merits mention among the most impressive man-made landmarks that the world has to offer. During the same excursion that brought me to Rushmore, I also swung by the Crazy Horse Memorial, which is nearby to Rushmore in South Dakota’s Black Hills. 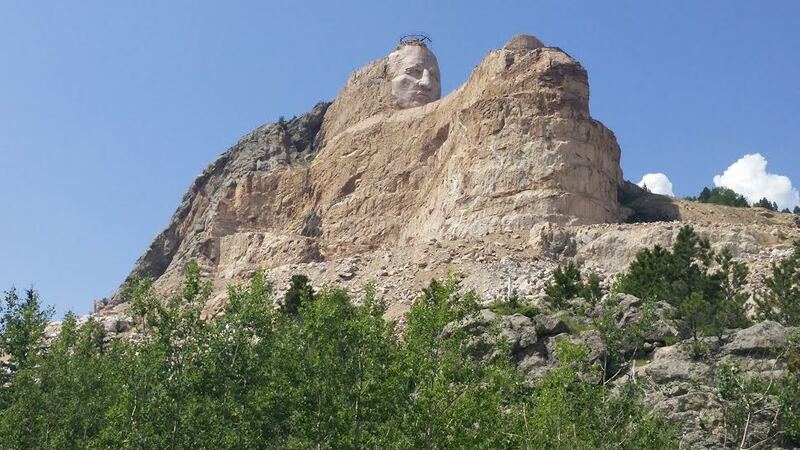 Although Crazy Horse is still under construction and is quite a long way from completion, it will one day rank alongside Rushmore for majesty and grandeur. 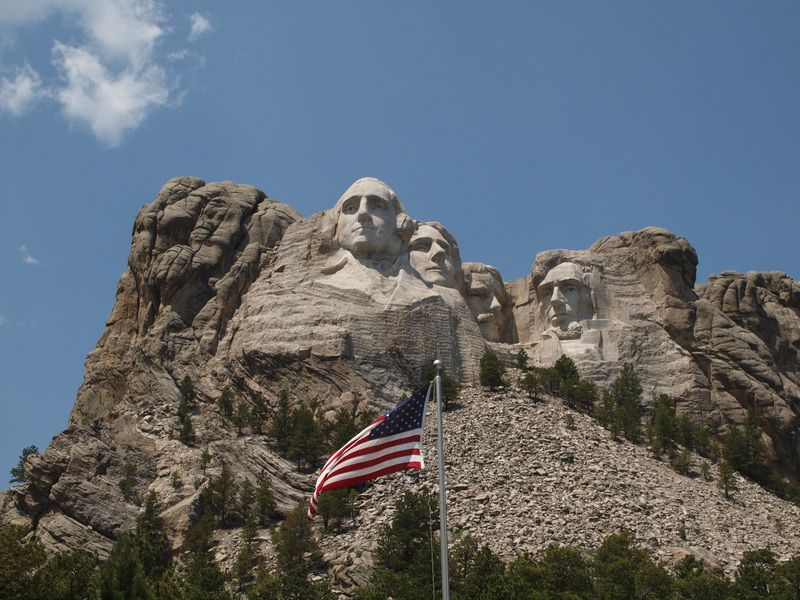 From 1927 to 1941, under the supervision of Danish-American sculptor Gutzon Borglum (1867-1941), the faces of four U.S. Presidents were carved into the sheer granite face of the mountain. But let’s take a step back to reflect upon how the idea for such a stupendous creation arose. 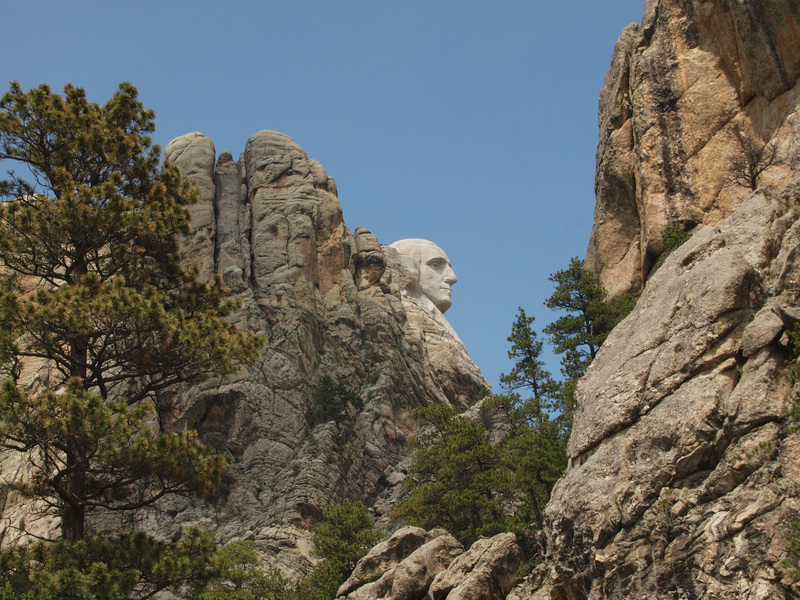 The notion of carving replicas of legendary personages in the Black Hills was first conceived of by Jonah Leroy “Doane” Robinson (1856-1946), who served for a time as South Dakota’s state historian, and who sought to create a tourist attraction. As envisioned by Robinson, the folks depicted would have been pioneers and other legendary figures of the Western United States, such as the explorers Merriwether Lewis and William Clark; showman William “Buffalo Bill” Cody; and Native American leader Red Cloud. But when Borglum was commissioned to bring the project to realization, he had a better idea. • George Washington (1732-1799) — the very first President. • Thomas Jefferson (1743-1826) — the third President. • Theodore “Teddy” Roosevelt (1858-1919) — the 26th President. • Abraham Lincoln (1809-1865) — the 16th President. I won’t even attempt to do justice here to the remarkable biographies and accomplishments of these Presidents who were so instrumental in forming and preserving the United States. However, I’ll address one question that may have occurred to you. Roosevelt, notwithstanding his brilliance and interestingness, and despite his consistently high rankings in polls among historians over time, may not seem to belong at the same rarefied level as his three fellow POTUSes who were chiseled into the mountain. He wasn’t one of the Founding Fathers, nor did he preserve the Union in the face of a bloody insurrection. So why was he chosen? Well, based on my research, Borglum selected Roosevelt for one or both of the following reasons: (1) Roosevelt, often dubbed the “conservation President,” had greatly expanded the system of national parks and monuments in the U.S., laying the groundwork for the establishment of the National Park Service; and (2) Calvin Coolidge, who was President when the Rushmore project was dedicated and later signed a bill to fund it, reportedly insisted on Roosevelt’s inclusion in order to ensure that two members of the Republican party would be represented on the mountain. (Lincoln was the first Republican President. Jefferson belonged to the now long-defunct Democratic-Republican party. Washington had no partisan affiliation.) For what it’s worth, this recent article argues that Roosevelt deserved the immortality in granite that Borglum bestowed on him. In March 1941, shortly before the completion of the project; Borglum died; his son Lincoln (named after Gutzon Borglum’s favourite President) guided it through its final months. The project actually ended prematurely. 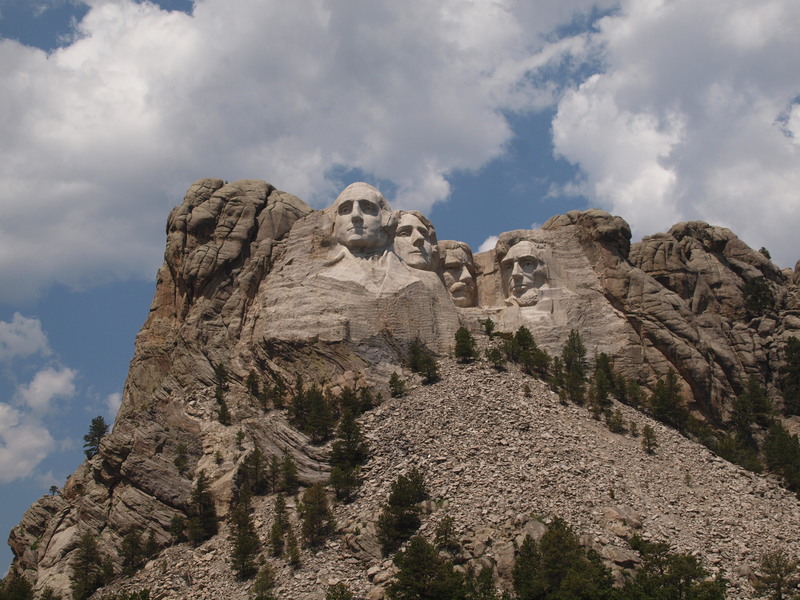 Under Borglum’s original plan, the mountain would have been adorned with not only the heads of the Presidents, but their chests as well. However, in October 1941, with preparations for the U.S.’s entry into World War II well underway, the money from Uncle Sam ran out, and the portions of the Presidents below their heads were never added. Even the heads, to which the monument was fated to be limited, each measure an astonishing 60 feet or so in height. These guys journeyed all the way from South Dakota to NYC to lure people to visit them at their habitat. 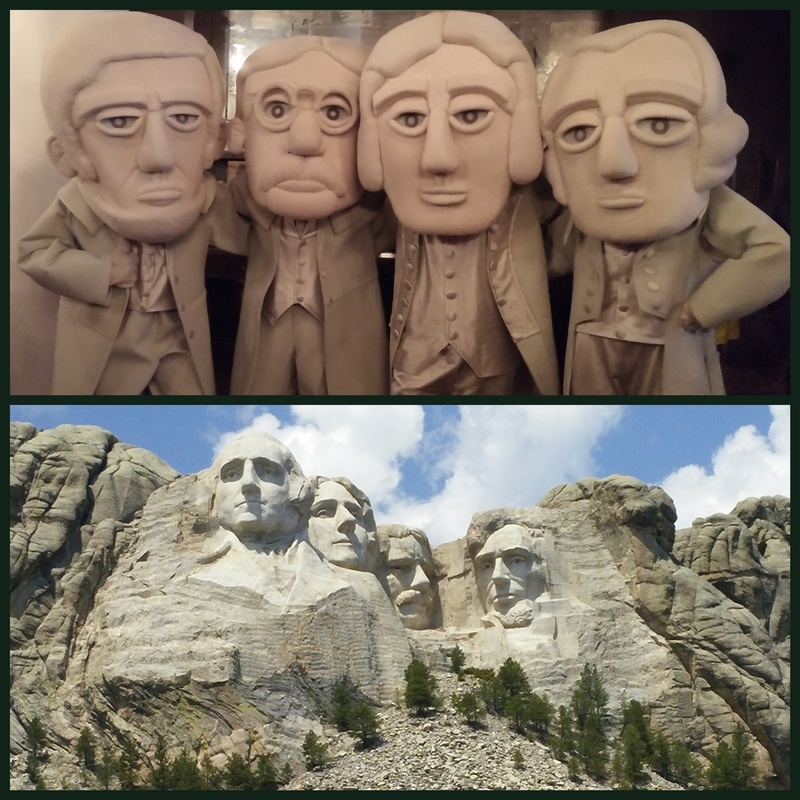 And these dead Presidents didn’t just stand there stone-faced; they broke out into dance! Showing the true gentlemen that they were in life, these dudes really knew how to cut a rug! Of course, Washington in particular was renowned for his ballroom dancing skills, although his terpsichorean moves on display in this video are somewhat more prosaic. After the music died, I began preparing to make my way westward to South Dakota. 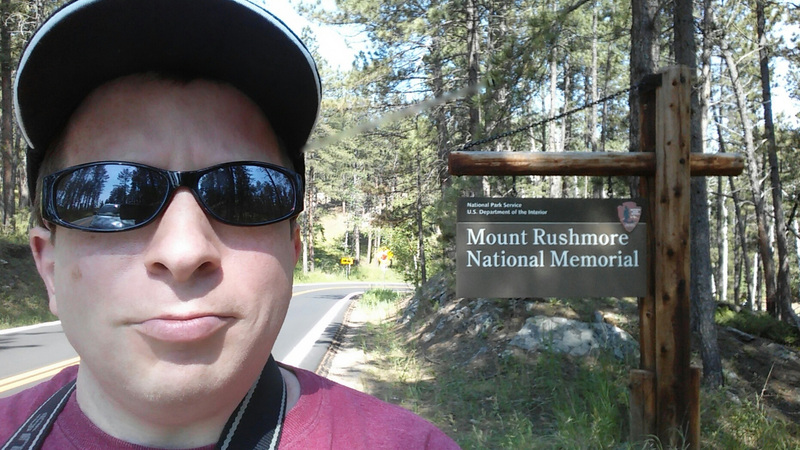 I’d decided to make my pilgrimage to Rushmore on America’s 239th birthday: Independence Day, July 4, 2015. That proved an inspired choice. It helped that the weather was highly cooperative; as you’ll see from the photos below, the skies above the area that day were absolutely gorgeous. And it felt fulfilling to walk through such a patriotic venue on the day that honours the founding of my country. Looking through a tunnel towards the monument. Now that’s what I call roadside scenery! While the approach to Rushmore was spectacular in its own right, I was excited to reach the hallowed grounds! This sign kind of speaks for itself. As you enter the main facility from the parking lot, you’re greeted by a bust of sculptor Gutzon Borglum. It was crafted by Borglum’s son Lincoln. 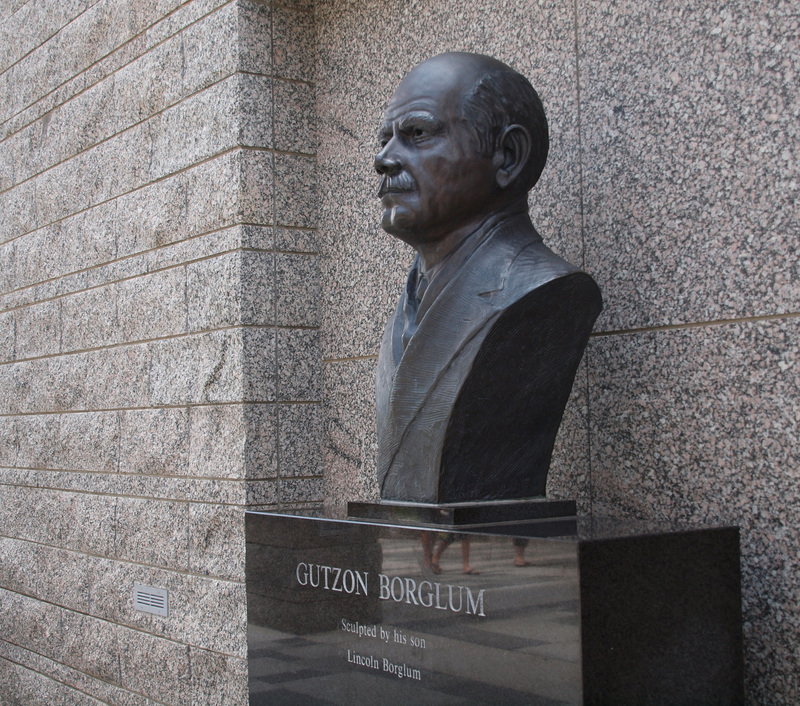 The man behind the mountain: This bust of sculptor Gutzon Borglum welcomes visitors to the Shrine of Democracy. An avenue flanked by columns that display the flags of all 56 U.S. states and territories. You then reach a scenic overlook called the Grand View Terrace, which delivered the reverence-inducing tableau that I’d traveled over 1,700 miles to gaze upon. (Underneath the terrace is the Lincoln Borglum Museum, which contains various exhibits and artifacts as well as a theater that shows a short film about the history and creation of the monument.) Beholding the quartet of Presidents in person — after seeing so many photographs of them over the years — lived up to, and even exceeded, my expectations. It’s really humbling to reflect on the technical achievement that the production of the Mount Rushmore monument entailed. Moreover, from an aesthetic standpoint, Gutzon Borglum’s masterpiece is eye candy that I never got tired of taking in. I travelled a long way to see these guys! And I wasn’t disappointed! 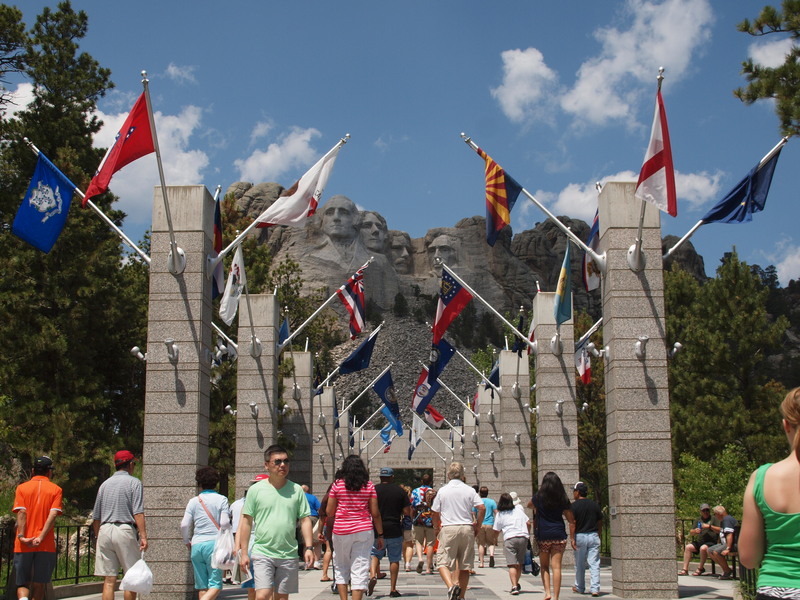 Mount Rushmore is an incredibly patriotic place to spend America’s Independence Day! On July 4th, an American flag flaps in the breeze, below the heads of four of the most storied American Presidents. At the top half of this diptych are the quartet of Presidents of Mount Rushmore, making a personal appearance at the Travel Massive meetup in NYC. 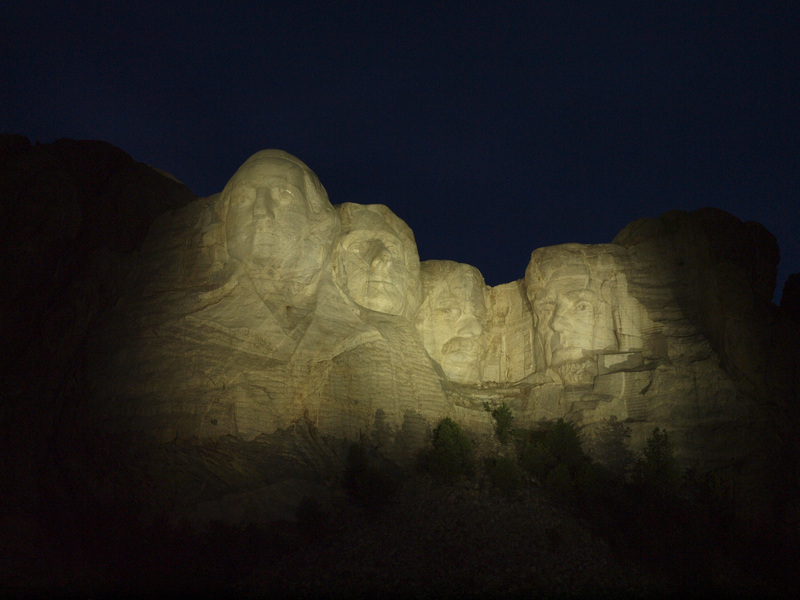 The lower portion shows the Presidents as they actually appeared on the mountain. Can you tell the difference? 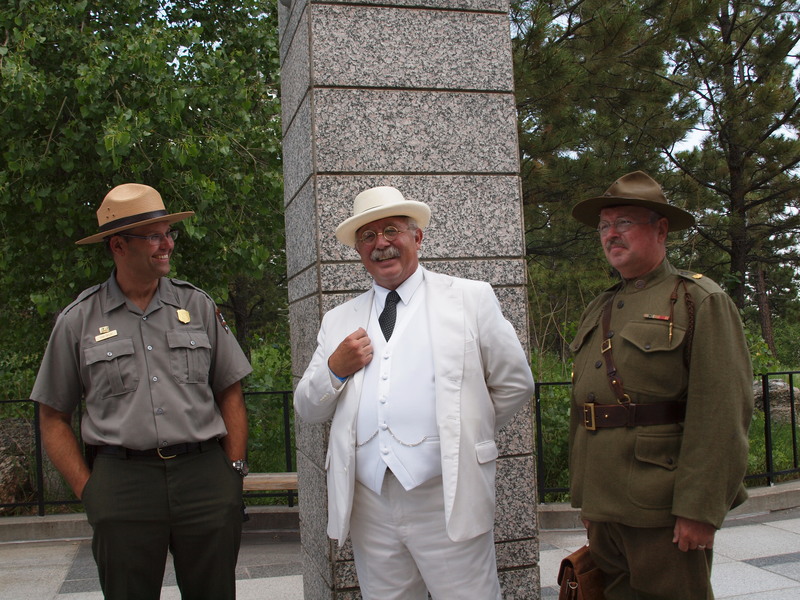 Two Teddy Roosevelts stand, side-by-side, while a park ranger looks on. The very different outfits sported by the pair of Roosevelts represent two distinct phases of Roosevelt’s career. I also had the pleasure of sighting none other than Honest Abe, in the flesh! A re-enactor of Abraham Lincoln. 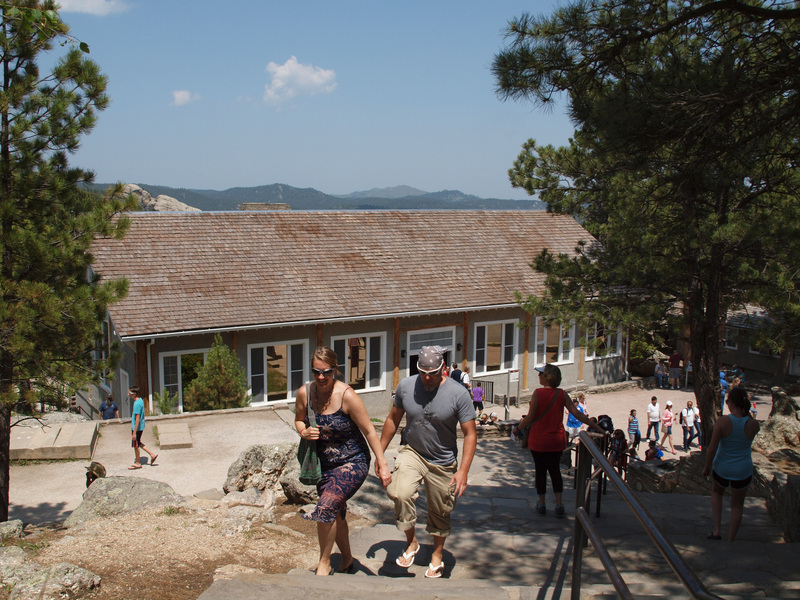 During your time at Rushmore, you can visit the sculptor’s studio, which is a short walk from the Grand View Terrace. 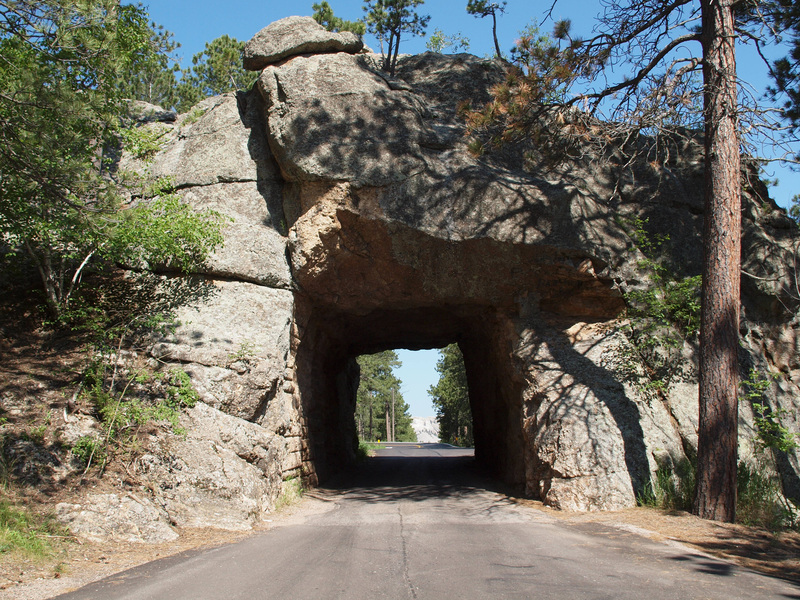 Approaching sculptor Gutzon Borglum’s studio at Mount Rushmore. 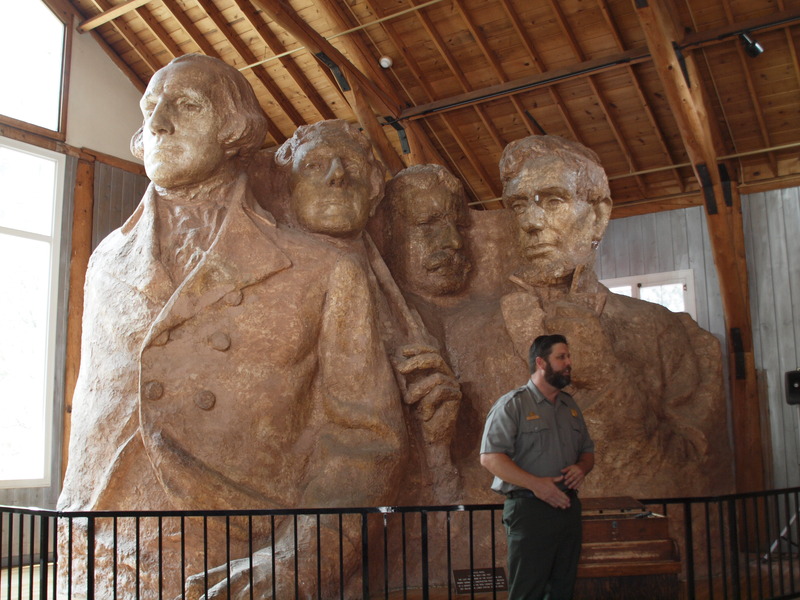 Inside the studio stands a model that Borglum erected, which served as a template for the carving of the Presidential visages on the mountainside. The ratio was one inch on this model to one foot for the actual faces. 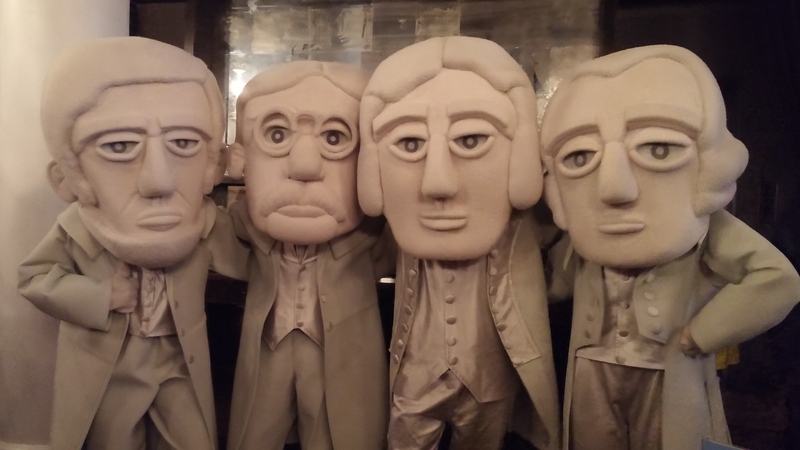 The model illustrates how, as mentioned above, Borglum’s plan was to represent the Presidents down to their waists, rather than only reproducing their heads. If his vision had been fully realized, Mount Rushmore would have a very different look from the one that we’re all accustomed to. Incidentally, what you see here is actually the last of several successive models that Borglum erected; previous models were dismantled. This final model remains in its original location in the studio, nearly three quarters of a century after the conclusion of the project. Also available for perusal in the studio are some of the original tools employed in the carving. Borglum’s models of the Presidents inside his studio show how he intended them to appear on the mountain. Profiles in courage: gazing upon the side of Washington’s head from outside the park. The previous photo in context, showing the scenic road from which it was taken. You don’t see streets like this in New York City! 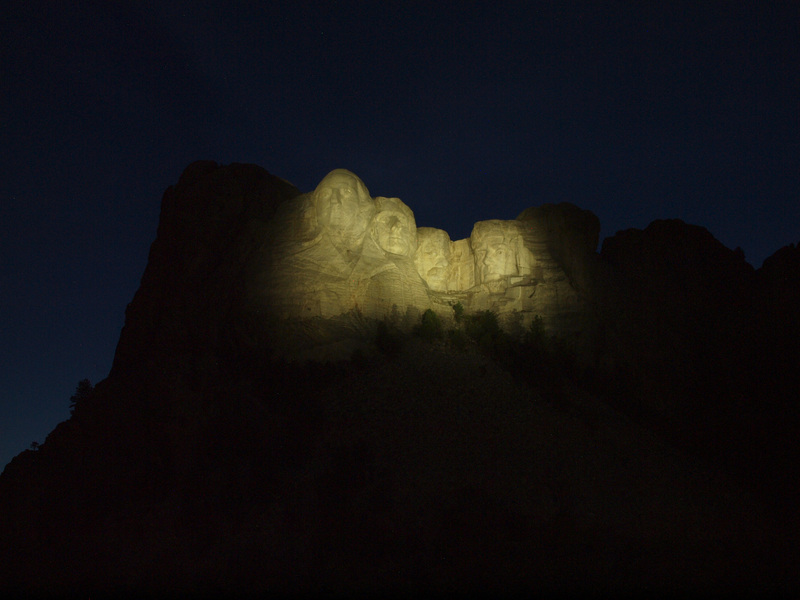 The faces of Mount Rushmore, illuminated at dusk. It’s traditional on the evening of July 4th for Americans to watch fireworks displays to commemorate their country’s declaration of independence on that date in 1776. No fireworks are launched above Mount Rushmore on July 4th or any other date, although the mountain would surely form a picturesque backdrop for pyrotechnic displays; I’m informed that this is in part due to the risk of brush fires in the area. Although I forewent the opportunity to take in a fireworks show on this Independence Day, I don’t feel that I missed out. Beholding the faces of four Presidents shining forth from the mountain was, for me, a very special way to celebrate America’s birthday. It was the capstone to my best-ever July 4th. • If things had been different, there would have been five faces on the mountain instead of four — and one of those countenances would have belonged to a woman. In 1937, a bill was introduced in the U.S. Congress to add women’s suffragist Susan B. Anthony alongside the four Presidents etched into Rushmore. Unfortunately, that same year, a rider to a Congressional appropriations bill mandated that federal monies for Mount Rushmore be allocated only for the four Presidential figures on which production was already underway. That rider was fatal to any expansion of the monument to append Ms. Anthony or any other new honorees. • The famous scene in the Alfred Hitchcock thriller North by Northwest (1959), in which Cary Grant and Eva Marie Saint are chased across the Presidential faces of Mount Rushmore, wasn’t filmed on location. The National Park Service refused to allow it. So the scene was filmed at a soundstage at MGM studios in Los Angeles. The Crazy Horse Memorial was conceived as sort of a counterpoint to Mount Rushmore, to reflect the idea that Native Americans had their own heroes and it would be appropriate to honour at least one of them with a comparable shrine. Crazy Horse (circa 1840-1877) is best known as the Lakota chief who led a coalition of Native American warriors to victory over the U.S. army at the Battle of the Little Big Horn in 1876 — a battle that’s often popularly referred to as “Custer’s last stand,” as U.S. army commander George Custer and all his men were killed in that engagement. 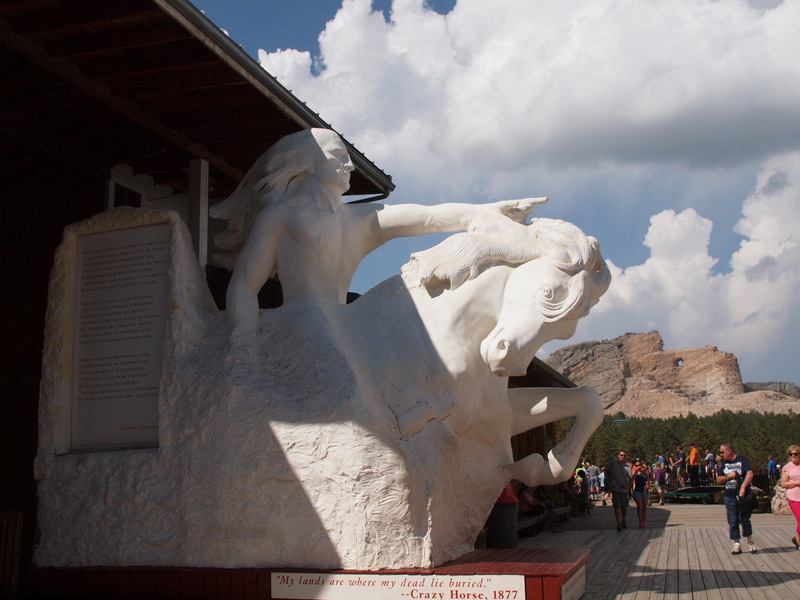 Located approximately 17 miles from Rushmore, the memorial to Crazy Horse was designed by the Polish-American sculptor Korczak Ziolkowski (1909-1982), who’d briefly worked with Borglum on Rushmore in 1939. Ziolkowski was recruited by Henry Standing Bear, a Lakota elder. 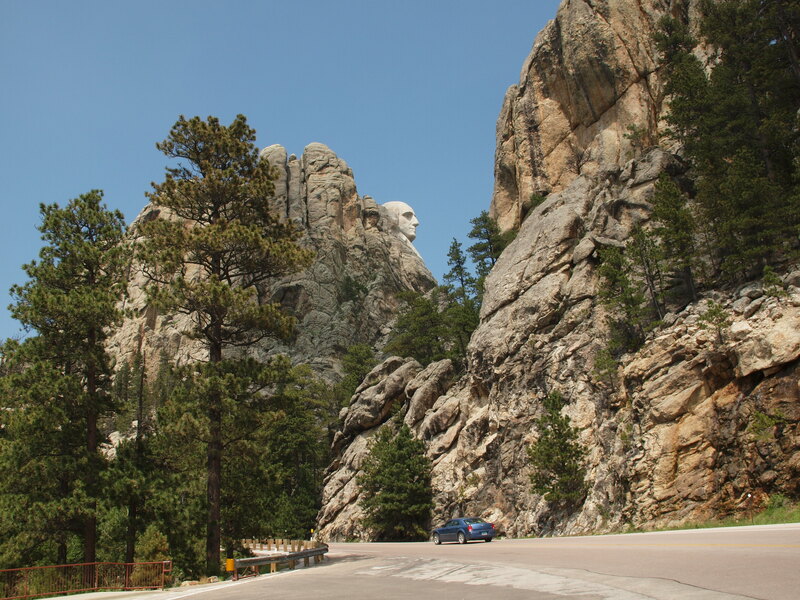 (Borglum had earlier turned down a request by Henry Standing Bear to carve Crazy Horse’s visage alongside those of the U.S. Presidents on Mount Rushmore.) 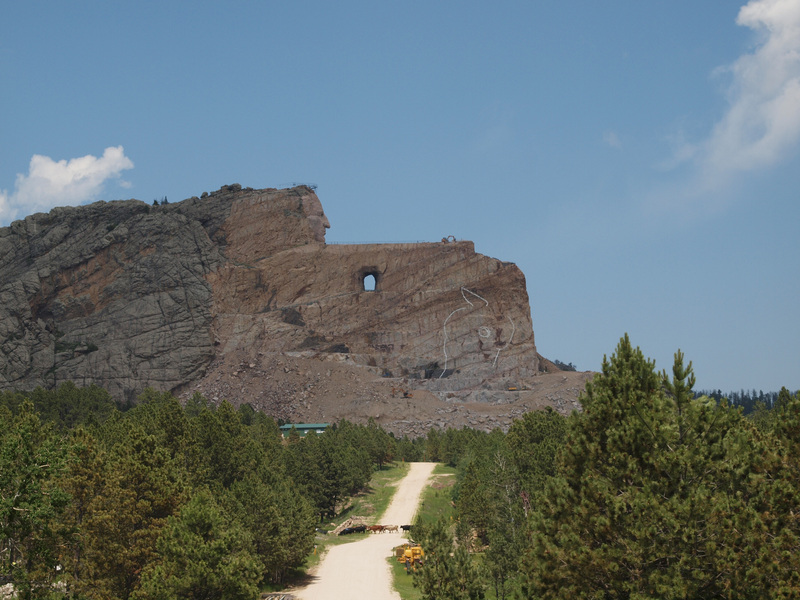 The glacial pace of Crazy Horse’s construction may be due, in part, to the fact that whereas Rushmore benefited from the largesse of the U.S. government’s coffers, Crazy Horse has been privately funded. (The construction site is on private land, and as far as I can tell, the mountain that’s being shaped into the monument didn’t have a pre-existing name.) When it’s finally finished, the Crazy Horse Memorial will soar 563 feet into the sky — making it taller than the Washington Monument — and will stretch 641 feet in length. After the death of Ziolkowski in 1982, construction of this colossus has continued under the guidance of some of his ten children. 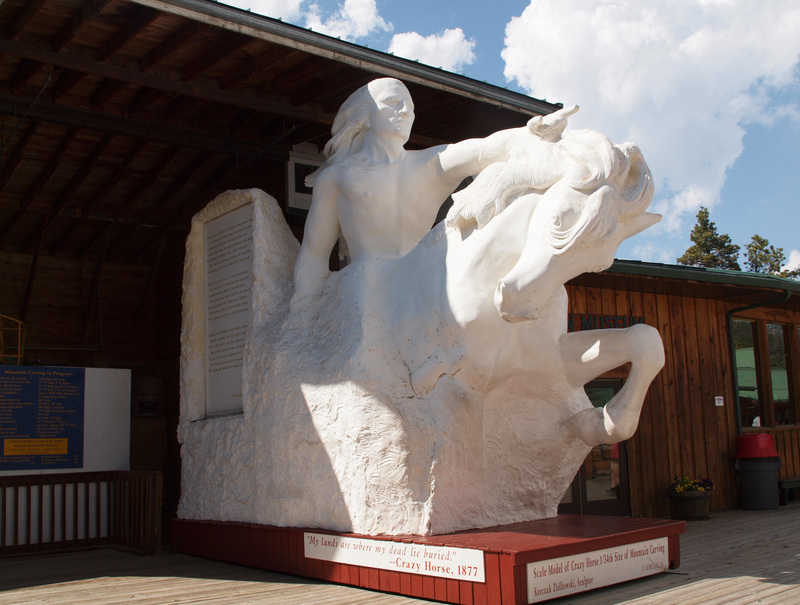 In their drive to erect the memorial, neither Ziolkowski nor his offspring appear to have been dissuaded by the fact that no one knows what Crazy Horse — the subject of the statue — actually looked like. Crazy Horse in profile, as seen from outside the visitor’s center. In the foreground, a herd of cattle can be seen crossing the road. Another view of the Crazy Horse Memorial in its current inchoate form. Although the memorial is still very much a work in progress, there’s a large visitor’s centre on the grounds; and eventually the site will also house an educational and cultural centre that will include a satellite campus of the University of South Dakota. Inside the visitor’s centre, numerous Native American artifacts are on display, and you can also watch a short film about the memorial. This model, on display outside the visitor’s centre, shows how the finished Crazy Horse Memorial will appear. A view of the model with the actual (in progress) memorial in the background. Every evening from Memorial Day through Native Americans’ Day (the second Monday in October), a multimedia laser light show, dubbed “Legends in Light,” is shown on the grounds of the Crazy Horse Memorial; the visuals are projected onto the sheer rock face. According to the memorial’s website, the show “dramatizes the story of the rich heritage, living cultures and contributions by Native Americans to our society.” I didn’t have the chance to attend the laser light show, but it’s something I would like to have done if I’d had more time during my trip to South Dakota. I don’t have nearly as much to say or show you about the Crazy Horse Memorial as I did about Rushmore; like I said, the site thus far consists of little more than a gargantuan head. But given its proximity to Rushmore, Crazy Horse is a worthwhile addition to your itinerary if you’re already planning to visit Rushmore. Combined, the two sites make for an unforgettable way to spend a day. Now, you may be wondering whether I performed any karaoke while in South Dakota. I’m pleased to report that the answer is an emphatic “yes”! 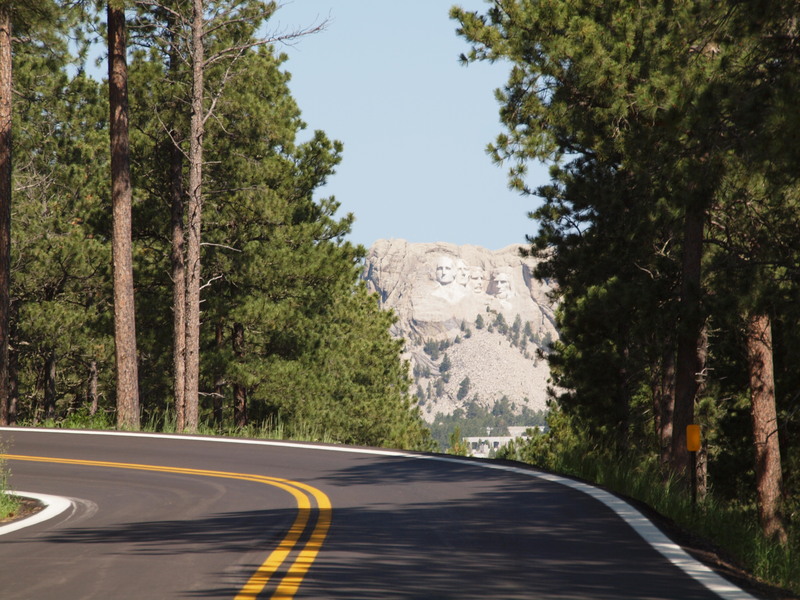 It happened in Rapid City, the second-largest metropolis in South Dakota (with a population of a whopping 73,000 residents), which happens to be the nearest major town to Mount Rushmore. Rapid City was where I was based during my stay in South Dakota. You can find full coverage of my awesome night of karaoke — including videos — in my next blog post, which discusses my adventures in Rapid City. A selfie of me with the Crazy Horse Memorial. Have you been to Mount Rushmore or Crazy Horse? If not, would you like to go? Wow, I’ve always wanted to go to Mt. Rushmore. It just hasn’t come up on any of our trip agendas yet. I loved all your pics! @Tamara: Thanks! And you’ll just have to add Rushmore to one of your trip agendas! When I lived in Colorado, in 2000, I wanted to visit Mt. Rushmore. I was discouraged from doing so as my (American) friends told me it was too far, and too cold at the time (it was December) to visit. And in the end, instead of a road trip to South Dakota, I spent that week with a horrible cold and fever, in bed. Go figure. It is one of those places in the US that I think I would really enjoy visiting. Thank you for your detailed and insightful post! @Claudia It’s true that The Black Hills area tends to get very cold in the winter, including December. Rushmore isn’t too far from Colorado, though; Rapid City, which is only a half-hour’s drive from the monument, is only about a 1-hour flight from Denver (which is the airport where I connected when I flew from New York). I hope you’ll get the chance to go someday! 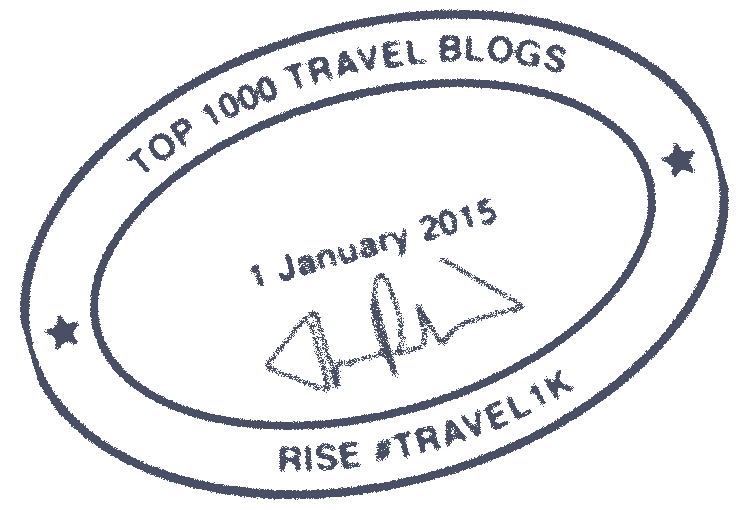 Great post full of content. So neat we were there the same time! Probably ran into each other without knowing it. They are definitely worth seeing, and along my road trip I was surprised at just how much there is to do and how beautiful South Dakota is! @Alyssa: That’s awesome that you went on July 4th too! I don’t know if we ran into each other without knowing it; Rushmore was incredibly crowded that day. (But the nice thing was that all those crowds didn’t interfere with photographing the heads, since I was pointing the camera up.) 🙂 Anyway, I’m glad you liked the monuments too and that you were as impressed with South Dakota as I was. That was a great post and I completely agree that bucket list items often seem to neglect the incredible sights in the US; this clearly being one of them. @Tim: Thanks for your kind words! And yes, Rushmore is one of the great sights not only in the U.S., but in the world. 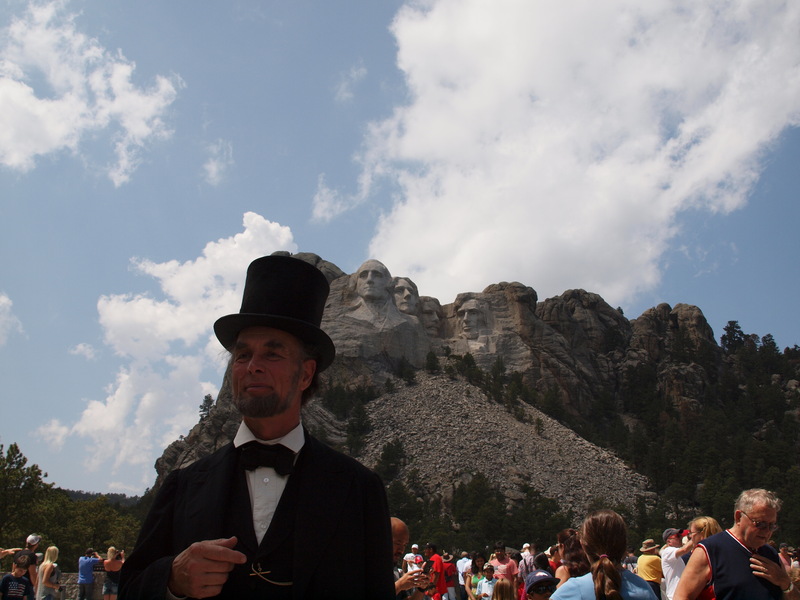 Spending the 4th of July at one of America’s greatest monuments… sounds like a blast!! I have done a lot of traveling to many countries, but I’m embarrassed to say that I’m an American who has never been to Mount Rushmore! It’s at the top of my to-see-in-America list. When I’m back in the states for a long enough period of time, I’m definitely visiting! Love the pictures at dusk. The faces did look pretty amazing when they were lit up at dusk. It must have been pretty amazing to visit on 4th July, even if there weren’t any fireworks! I’ve never been but I would like to go, it must be a pretty surreal sight! @Emma: It was amazing. All future July 4ths will probably be a letdown. 🙂 And it was awesome to see the iconic faces in person. Cool piece H-Bomb! I’ve always wanted to visit these guys at some point in the future – I just can’t think of any other country with their former leaders giant faces carved into the side of a mountain. What better time to visit than on July 4th too! Thanks, @Andrew! Yes, Rushmore is a pretty unique concept worldwide as far as national monuments go. 🙂 And July 4th was an amazing time to visit. Cool facts that I didn’t know! Thanks for sharing and for such an informative post. I really want to check out this monument one day! Great post. I’ve always wanted to visit Mount Rushmore. It’s such a bizarre attraction! I love learning about the back stories of the creation of such well known and iconic tourist spots. I’m particularly fascinated by the dedication and emotion the creators always seem to have. 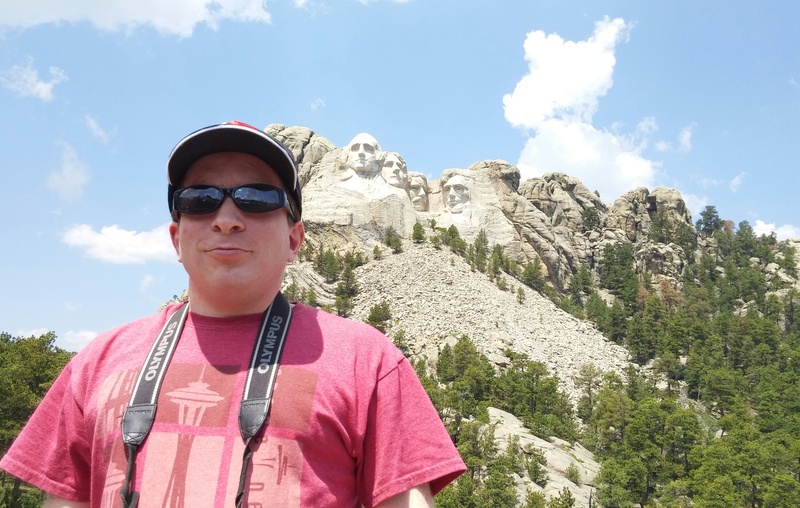 Mount Rushmore is such a well known destination and I really enjoyed the different views and perspectives you showed us. @Jo: Thanks. That’s one of the reasons I enjoy visiting famous sites: not just to see the place with my own eyes (although that’s often pretty special too), but to learn more about their histories. While you can often learn background facts by watching a YouTube video or reading a book, there’s more of a context when you’re actually at the site and can see artifacts such as the model in Borglum’s studio. And you can ask questions to your local tour guide or a park ranger or other on-site employee, so it’s a more dynamic learning experience. Mt. Rushmore has never been on my radar. It’s just so far away without anything else nearby, BUT your photos are amazing, and if I ever find myself in the upper midwest, I’ll definitely make a detour to see the guys in granite. I’m so glad that Mt Rushmore exceeded your expectations, and yes, totally fab choice of day to visit! I’ve actually been weary about taking it in because South Dakota seems like a long way to travel for me to view something I’ve already seen many times in photos, but you’ve got me thinking that it may actually be worth the trip. I’m always a big advocate of actually seeing things with your own two eyes instead of settling for photos, so I’m so glad to hear that it took your breath away once you were actually there. And thanks for including the additional history around the landmark – I’m Australian so I know a little about it, though this post helped me understand a lot more 🙂 And I did learn that there’s a lot more to do in the area than I had originally given South Dakota credit for. Thanks!! A lot of the history that I learned during my visit, and then during the course of writing this blog post, was new even to me. 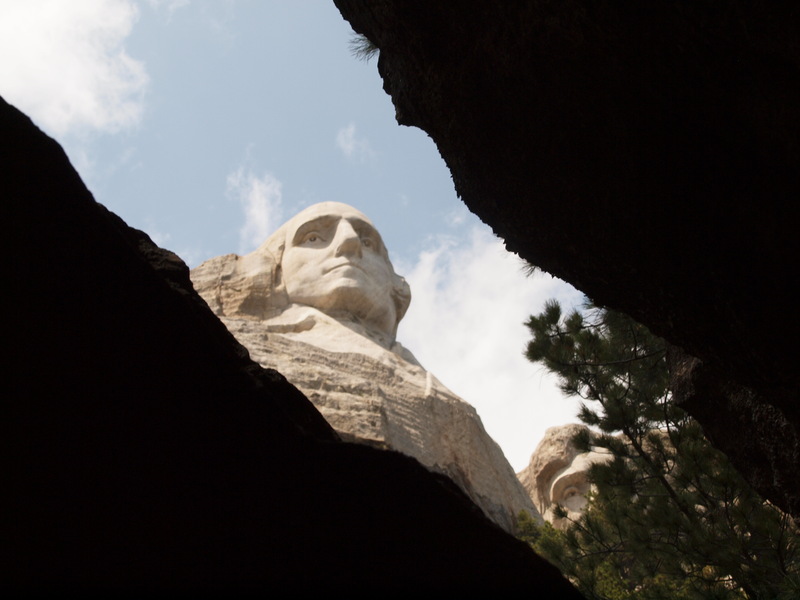 Even most Americans probably couldn’t tell you much more than the names of the Presidents on the mountain and, in some cases, the identity of the sculptor. So, part of the reason that I too strive to see great landmarks in person is because it’s a way to learn about the history of the site in greater depth. It’s also true that there are numerous other top-notch attractions in South Dakota; Rushmore and Crazy Horse are among what the DMO’s over there refer to as the “Great Eight.” If you fly into Rapid City (the major town nearest to Rushmore), you could also combine a visit to Rushmore with some time in a city like Chicago or Denver from where there are direct flights to Rapid City Regional Airport. I just went to South Dakota to see Mount Rushmore and the Crazy Horse Memorial a couple of months ago. I enjoyed reading all of your detailed historical information and insights about your experience! I always appreciate having those insights behind what I’m visiting and seeing. Also, please feel free to check out my post on South Dakota on my blog: http://passportcouture.com/historical-south-dakota. Thanks for such and informative post!